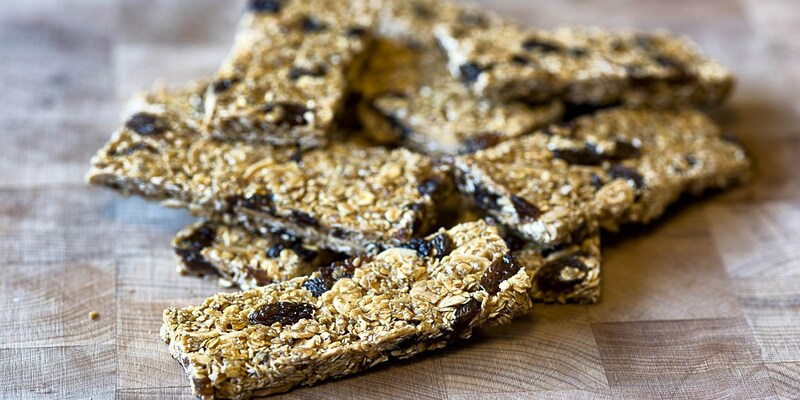 Homemade granola bars are simple to make and much more delicious when cooked at home. Knowing exactly what has gone into them ensures peace of mind, as all too often shop-bought varieties can include nasty additives and incredibly high amounts of sugar. They’re great for elevenses or kids’ lunch boxes, and they’ll keep for up to a week in an airtight container (if they last that long). Oats are a good source of energy and nuts (in this case almonds) provide protein. This recipe makes ten well-sized bars. You can add any dried fruit you like to granola bars; try cranberries, apricots, figs or even crystallized ginger. Dried pineapple, coconut and mango lend a tropical twist. You can also use other nuts. Pecan, hazelnuts and macadamias all work really well; just remember to toast them first for maximum flavour. For a treat, add a few chocolate chips to the mix whilst the mixture is still warm. They’ll melt through and help hold the bars together (as well as adding lots of delicious sweetness). Citrus zest from lemons, limes or oranges adds a fresh zing to granola bars, while spices such as cinnamon or nutmeg add warm, comforting flavours.